The Post War Welfare State is crumbling - who is to blame for it? The Current welfare state changed in such a way that a true reflection is required as to how this has come about and its context. It seems that the current welfare reforms have removed the safety net which the welfare state was supposed to provide and is putting the most vulnerable people in our society at serious risk. I recently advised Shazna Rahman*, a Bangladeshi Muslim woman in Newham. She came to seek debt advice from me at Toynbee Hall, a charity in Tower Hamlets that helps communities in poverty. She was wearing full black burkah. This is a piece of clothing covering her body completely. It was not the manifestation of her faith that struck me most, but the reality of her difficult and hard life. Her children were taken away from her by Social Services because she was unfit to look after herself and her children due to a highly traumatised divorce that resulted in a mental breakdown. She moved from Tower Hamlets to Newham into private accommodation. She claimed housing benefit to pay for her rent. After a few years, she became homeless when her private landlord wanted to rent the property out to a professional couple who would pay more. Newham council put her in temporary accommodation because she was deemed in priority need due to her mental health. Her personal circumstances made me think about the state of poverty that many ethnic minority residents in Newham, Tower Hamlets and Hackney experience. These boroughs are in the heart of the East End. Ethnic minority residents form a significant proportion of the population in these boroughs. According to Newham Council’s data, 46% of the borough’s population are Asian and 18 % are black - Afro-Caribbean. 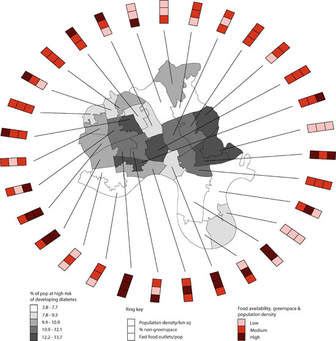 In Tower Hamlets, 41% of the borough’s population are of Asian background, 32% of whom are of Bangladeshi origin. In Hackney, the largest ethnic minority group is Afro-Caribbean at 23.1% followed by Asian at 10.5% according to 2011 Consensus. Shazna’s initial contact with me over a year ago was about her inability to pay £27,000 in loans and credit debts. I was able to support her with a temporary outcome by offering minimum payment to her creditors. But there appears to be an endemic problem in the East End according to research carried out by the Money Advice Service. I began wondering how prevalent indebtedness was in her borough. Newham has been categorised as the UK capital of indebtedness. 22.7% of its population are in debt. Tower Hamlets has the same level of people in debt as Newham. Hackney was not far from it -20.9%. “Lone-parent families were much more prevalent among Black African and Black Caribbean households. Lone-parent households are known to have higher risk of poverty due to the pressures of combining work and childcare for lone parents.” Hackney has the highest infant mortality rate compared to any other borough. 5.4 babies die per 1,000 live births. In terms of employment in these three boroughs, 35.6% of employees in Newham are in low paid jobs; the highest percentage in London and 10% higher than the Londonaverage and only lower than the poverty rate in Tower Hamlets. In Tower Hamlets,19.8% of ethnic minority UK nationals are unemployed, compared to the UK average of 7.8% and a London average of 8.3%. 11.7% of ethnic minorities in Hackney are unemployed. 1 in every 25 residents in Newham are in temporary accommodation and the prime cause of their homelessness is the ending of a private sector tenancy. Shazna’s reasons of homelessness illustrate the true characteristics of many ethnic minority residents in Newham. She was given notice to quit by her private landlord’s desire to let his property to a non-benefit claimant. In Tower Hamlets, 4 in every 1000 applicants were accepted by the council as homeless. In Hackney, the figure is slightly higher: 7 in every 1000 application. - £296.35 a week if you are a single person and live in London. In Tower Hamlets, Universal Credit was rolled out in March 2017. Of all local authority tenants who were on universal credit following rollout, 83% were in arrears. From 24 July 2018, everyone who is of working age, and requires welfare benefit support is to claim universal credit in Newham. Data is yet to be analysed as to how communities in the borough have dealt with it. The roll out of the benefit will be extended to Hackney from October 2018. Local government budgets have been significantly reduced because of welfare reforms. 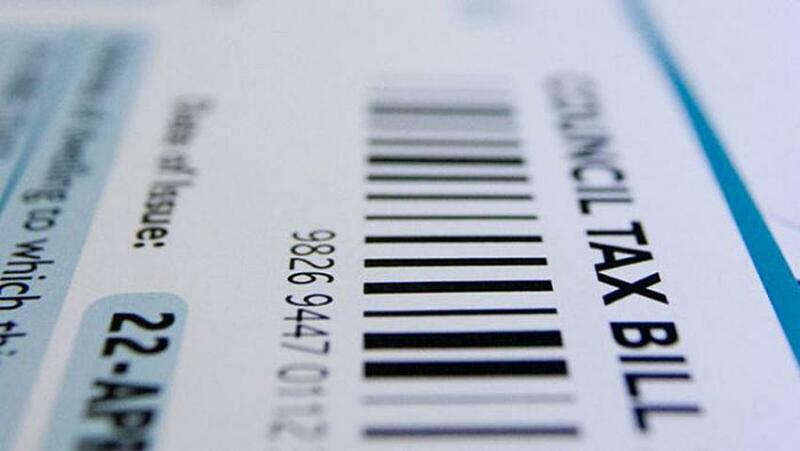 To maximise local income, council’s in the country introduced policies where the poorest residents were required to contribute towards their council tax bill. In Newham, at least 20% of the council tax bill needs to be paid by working households regardless of whether they can afford to pay. It was the fear of not being able to pay her council tax bill that saw Shazna come back to seek advice from me a few months ago because her existing Employment Support Allowance did not cover the cost of paying what Newham council wanted her to pay. As a result she is now in arrears. The fear of the bailiff knocking on her door made her feel anxious and she wanted advice. According to Money Advice Trust, Newham Council made the most bailiff referrals in the last 12 months (2016/17) - 55,652. This is 50% of bailiff referrals as a percentage of the total properties according to Money Advice Trust. Following the direction of Newham Council, Hackney Council, from April 2018, reduced council tax support from 15 to 17% for its working age households. Individuals who are on Jobseekers Allowance and Employment Support Allowance will find that they need to prioritise between paying for food or the council tax bill. In Tower Hamlets residents have been exempted from paying council tax due to their low income. Individuals who are self-employed, however, are deemed to pay full council tax without means testing their ability to pay for it. This blanket approach has resulted in several Tower Hamlets residents seeking advice from me. Most of them are ethnic minority Bangladeshis. Shazna’s experience tells me a great deal about the life of many forgotten minority communities in the East End. Welfare reform and policies are resulting in people who were already in a precarious financial situation being tipped over the edge. The challenge for someone like Shazna is whether to pay her food or visit her local foodbanks. Herburka, in my opinion, covers the harsh reality she is living in East London. When she began to feel comfortable speaking about her troubled life to me, after a few advice sessions, she no longer wore the burka. 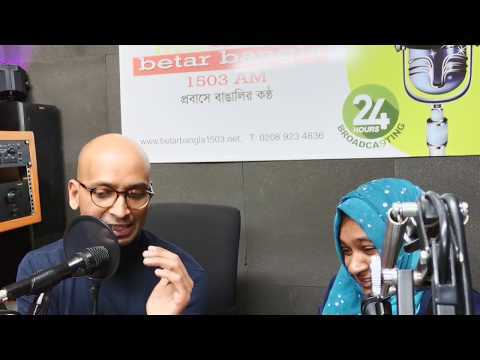 *Shazna Rahman is not her real name. To protect her identity and privacy I changed her name and slightly changed her factual situation. This is what one of my clients said to me when he first came to seek advice for his rent arrears. It was in September 2016. He was 56 years old but would not be eligible for the state pension for another decade. What struck me about him was his proposal to unlock his pension funds to pay for his rent arrears. It made me think about men in his age group, how they lived and how severe their financial and other problems can be and the challenges they face trying to rectify it. These are problems that, as things stand, will persist until their retirement age. As I dug deeper into this gentleman’s personal circumstances, I discovered how he had fallen into poverty. His life was thrown into chaos once he was faced with early retirement. He previously worked for a local council and his role was made redundant. He was presented with two options: retire or take compulsory redundancy from his job. This was a role had held for over 25 years. He opted to take early retirement. He struggled to adjust to his new circumstances. His marriage came under strain due to money troubles, his depression and anxiety. His wife initially tried to help and support him, but she found it hard to cope with his mental health problems. As a result, she asked him to leave their council home. His 20 year marriage ended a year after he retired. He lived rough for a few days and then found private accommodation in Summer 2016. He paid £750 per month for a room. He shared the flat with two other housemates whom he rarely saw and had some savings from which he paid his rent. However, he used up his savings and could no longer afford the rent. When he moved into the room, he did not know whether he could claim housing benefit for it. If he had applied for housing benefit before 1st April 2016, he could have backdated it for the three and a half for months he was in arrears. The actual rule, in force at the time, allowed him to claim up to 6 months of his initial claim date if there was a good reason for it. From 1st April 2016 any claim made were only allowed to be backdated for only one month regardless of the reason. This was the new policy introduced by the current Conservative Government. The Coalition government (2010 - 2015) introduced another policy. From 1st April 2015 any person, who is 55 years old or above, could gain access to all their pension funds. The purpose of this policy was to put the pension holder in control of their pension funds and withdraw all their savings if they choose. Given this man’s circumstances, I doubt whether he was choosing to get his pension fund released to better himself. A more accurate reason would be that he was withdrawing his pension funds to avoid destitution. Initially I had no idea of such a rule when I advised him because I recommended to him that he see a financial adviser. If he has, subsequently, fallen into the wrong hands, it could be that he may have lost more than his accommodation. 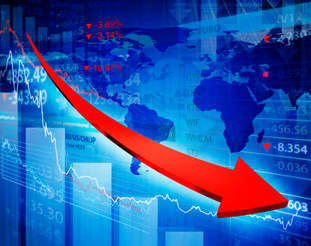 There has been a dramatic rise in fraud related to unlocking pensions. A large number of people have been duped into releasing their pension early only to then lose all of their life savings. Fraud Action, which investigates online fraud, reported that between April 2014 and May 2017 fraudsters stole nearly £44 million by giving false advice and transferring the money to a broker. The promised returns did not materialize leaving the victim penniless. Although I have had no further contact with the man beyond our first debt advice meeting, I hope he does not become one of the victims who have been conned in this way. Could there be any other support he may need if his landlord successfully evicts him from the property and he becomes homeless again? It is going to be difficult for him to qualify for the local council’s priority list for social housing based on his existing circumstances. According to Shelter the waiting list for social housing in the UK has reached a record high of more than a million. It is hard to believe that local authorities would prioritise him. Households with children and severely disabled members are often given priority for emergency accommodation. The local council may also argue that he made himself intentionally homeless by not paying his rent in time and getting into rent arrears from his landlord. I believe that he is in debt because of the current government’s rule change on housing benefit claims. In terms of him getting him ready to re-enter the labour market, I am not sure whether this is possible until he has a stable home environment. There are over a million people in the UK, in their 50s, who are willing to work but cannot work due to age discrimination. This has been emphasised by the Women & Equalities Committee who found that the labour market prefers younger workers. Even for this man to start thinking about employment he would require professional advice, help with his CV, assistance in cover letter writing and preparation for job interviews. He may also require appropriate clothing to wear for an interview. The process of returning this man to the labour market appears to be very complex indeed. This tragic story has illustrated how those who seek debt advice often do not just have problems concerning money. They bring many other societal issues that are beyond my control as a Debt Adviser. This gentleman initially asked me if his landlord would stop eviction proceedings if he released his pension funds. In truth this man requires more than advice on debt if he is to stabilise his circumstances and live a decent life. I have noticed a dramatic change in my line of work as a debt adviser following the introduction of Universal Credit in 2013. It has become common to see clients who are in rent and council tax arrears. In areas where it was initially rolled-out, 73% of claimants were in arrears and owed on average £772. Ian Duncan Smith, former Secretary of Department for Work and Pensions, stated that the policy was meant to take people out of poverty. Its impact has been to the contrary. It was one of several welfare reforms introduced by the 2010-15 Coalition Government under the Welfare Reform Act 2012 which was planned for implementation by March 2022 as part of overall austerity measures. Universal Credit replaces the following benefits: Job Seekers Allowance, Employment Support Allowance, Housing Benefit, Working Tax Credit and Child Tax Credit. Universal Credit affected claimants of working age. Claimants would now receive the benefit monthly and would be responsible for managing their money. For example, rather than making payments direct to landlords, the claimant would be required to update their details by going online. Council Tax Benefit is no longer included as part of the claim. Local authorities are responsible for formulating their own policy in regard to the Council Tax Reduction Scheme. At the same time, they are not allowed to increase it by more than 5.99% year on year without calling a referendum. 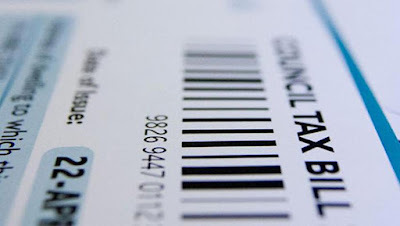 Most councils in the UK are no longer giving full Council Tax Reduction even to individuals who were deemed too poor to pay prior to the enactment of the Act. Severe disability and enhanced disability premiums that topped up the legacy benefits were scrapped. Leigh Day & Co Solicitors challenged the lawfulness in removing the disability premiums as existing claimants who migrated to the new system saw a loss of more than £150 per month of benefits on the basis that it is discriminatory. There were other challenges faced by many claimants. Until 7 November 2016, a couple with children would be capped at £500 per week, whilst for single claimants it was £350. From 7 November, the cap was reduced further depending on where clients resided. - £257.69 a week if you are a single person and live outside London. In areas where Universal Credit was first introduced such as in Oldham one in four tenants were threatened with eviction according to First Choice Homes, one of the biggest social landlords in the area. In Thamesmead, New Charter Housing confirmed 85% of its tenants were in arrears when they moved to Universal Credit compared to 18% under the legacy system. The Housing element of Universal Credit faced problems due to the requirement for some claimants to show a recent tenancy agreement. Also, if they were affected by the bedroom tax, the housing component was decreased by 14% if they had one spare room. If they had two spare rooms, reduction of Housing Benefit is 25%. 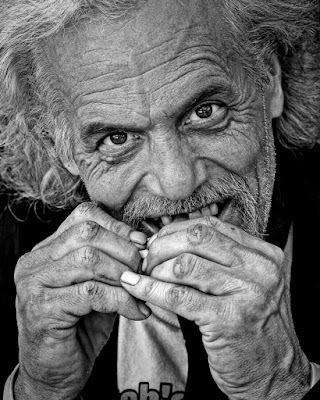 To cover the shortfall, claimants may apply for Discretionary Housing Payment; though not everyone who applies is successful. The Trussell Trust, which operated 30 food banks in the full Universal Credit roll-out areas in England and Wales, published a report: ‘The Left Behind: Is Universal Credit Truly Universal?’. The Trust’s data showed that 70% of foodbank users were in debt, 57% experienced issues with their mental or physical health, and 56% experienced housing problems due to the introduction of the policy. The DWP’s draconian benefit sanction was intensified parallel to the implementation of the new benefit system. According DWP’s own data from August 2017 and October 2017, 38% of all the Universal Credit decisions resulted in a sanction and 71% of these accounted for not attending an interview. According to Citizen Advice, claimants who are self-employed may lose on average £630 a year compared to an employee due to their presumption to have been earning the National Minimum Wage (NMW) under the new scheme. It seems that those who were deemed too poor to pay their rent and council tax prior to the introduction of the welfare reforms, now must pay towards their council tax whilst claiming benefits. As a debt adviser, I am seeing clients who are in rent and council arrears on a more frequent basis. This leads me to conclude that the system does not care about those who are struggling to make ends meet. ‘I have not been able to pay my council tax for last four years. Bailiffs have lied to me to get money from me. I still can’t afford it!’ says Joanna Robinson on Money Matters show on East London Radio in March 2018. During the period 2016-17, bailiffs were used by councils on nearly 1.5 million occasions in order to attempt recovery of council tax arrears. As in Joanna's case, residents were summoned to court for being too poor to pay - accruing court costs, subjected to the ignominy and anxiety having to face enforcement agents, and already too poor to pay, further indebtedness. As I hear the horror stories of bailiff’s knocking on debtors’ doors under the new Council Tax Reduction Scheme (CTRS), I am beginning to worry that the Scheme is really just a Poll Tax rehash. I was too young to remember what the Poll Tax was when it was first introduced in the late 1980s. My parents never spoke about it. In my work I started to notice from 2013 onwards that more debtors were seeking advice from me primarily regarding council tax arrears. Councils say they need to charge residents more; they blame the central government’s austerity measures for their budget shortfalls and therefore increased charges are necessary. What, then, was this Poll Tax to which I am drawing comparisons with the Scheme? With few exceptions, such as those with severe mental impairment, members of religious communities and those sleeping rough, there were no exemptions. Even those receiving income support still had to pay 20%. According to the government’s own survey 2.8 million people did not pay Poll Tax between 1991-2. To recover such a mountain of unpaid debts, councils throughout the country tried to recover sums from workers’ salaries; and some of those on benefits had money deducted from their benefits. In most instances, local councils were not able to recover sums from benefits since what was owed was often too large to be recovered within the relevant financial year, once the Liability Orders were obtained from Magistrates Courts. In such situations councils would pass these debts to private bailiffs for recovery. According to local law centres in Bristol, bailiffs delivered over 4,000 notices in May 1991 for non-payment; only half a dozen of them were recovered. By July 1991, when the tax had been in place for more than two years in Scotland, bailiffs had carried out over 41,100 visits but they hadn’t managed to sell goods of a single individual. According toHackney Gazette, debt collectors themselves incurred cash flow problems because they needed to employ more people to recover arrears but received less money from Hackney Council. The Labour Party did organise a campaign, Stop It!, in response to outcries. Its priority, however, was to win the national election and to replace the Tory government in Parliament. It was not going to resolve the immediate concerns faced by poorer residents and campaigners who were getting understandably frustrated with the way things were. 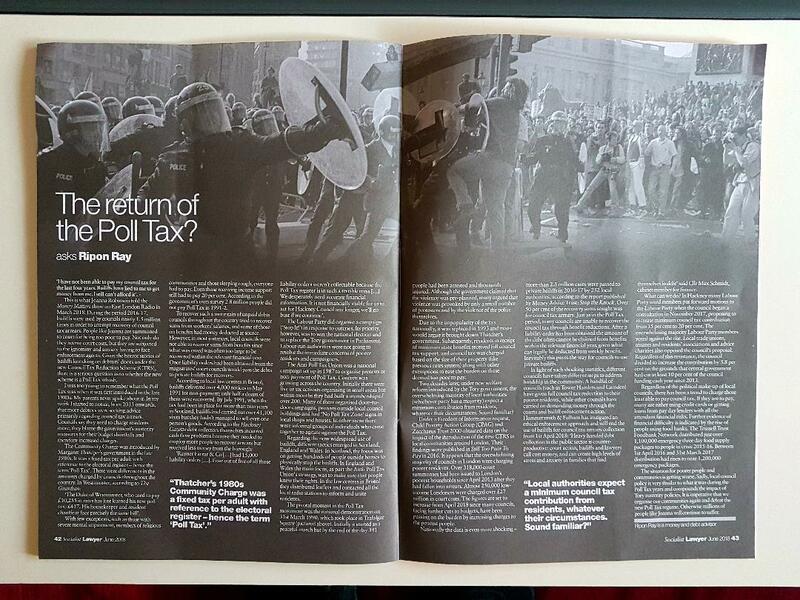 The Anti-Poll Tax Union, a national campaign was set up in 1987 to organise protests or non-payment of Poll Tax. Concern was growing across the country. Initially there were 5 or 6 activists organising in small localities but within months they had built a membership of over 200. Many of them organised door–to-door campaigns, protests outside local council buildings and had ‘No Poll Tax Zone’ signs in local shops and houses. In other areas, there were informal groups of individuals who came together to agitate against the Poll Tax. Regarding the now widespread use of bailiffs, different tactics emerged in Scotland, England and Wales. In Scotland, the focus was on getting hundreds of people outside homes which were threatened and physically stopping the bailiffs. In England and Wales, the main focus, as part the Anti- Poll Tax Union's strategy, was to make sure that people knew their rights. In law centres in Bristol, they distributed leaflets and contacted all the local radio stations to inform and unite residents. The pivotal moment in the Poll Tax movement was the national demonstration 31 March 1990 took place in Trafalgar Square called by the non-payment campaign. Initially it started as a peaceful march but by the end of the day 341 people had been arrested and thousands injured. Although the government argued that the violence was pre-planned, many argued that violence was provoked by only a small number of protesters and by the violence of the police themselves. Due to the unpopularity of the tax nationally, it was replaced in 1993 and many would argue it brought down Margaret Thatcher as Prime Minister. Subsequently, residents in receipt of minimum state benefits received full council tax support; council tax was charged based on the size of their property; like previous rates system, along with other exemptions to ease the burden on those deemed too poor to pay. Two decades later: new welfare reform was introduced by the Tory government - the overwhelming majority of local authorities, either Tory or Labour, expect a minimum contributions from residents, whatever their circumstances. Sound familiar? Under a Freedom of Information Request, Child Poverty Action Group (CPAG) and Zacchaeus Trust 2000 obtained data and undertook a research project on the impact of the introduction of the new CTRS in local communities around London. Their findings were published in Still Too Poor To Pay in 2016. It appears that the overwhelming majority of councils in London were charging poorer residents. Over 318,000 court summons had been issued to London’s poorest households since April 2013 after falling into arrears. Almost 250,000 low income Londoners were charged over £27 million court costs. The figures are set to increase from April 2018 since many councils, facing further cuts to budgets, have been passing on the burden by increasing charges to the poorest people. Nationally the data is even more shocking - more than 2.3 million cases were passed to private bailiffs in 2016-17 by 252 local authorities, according to the report published by Money Advice Trust’s Stop the Knock. Over 50% of the recovery sums sought was for council tax arrears. 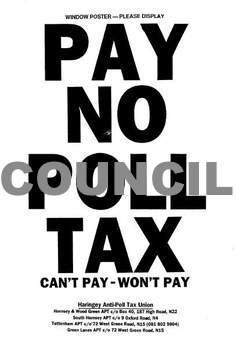 Just as in the Poll Tax period, many councils are unable to recover the council tax through benefit reductions. After a Liability Order has been obtained the amount of the debt often cannot be claimed from benefits within the relevant financial year, given what can legally be deducted from weekly benefit. Inevitably this paves the way for councils to use private bailiffs. In light of such shocking statistics, different councils have taken different steps to address hardship in the community. A handful of councils have given full Council Tax reduction to their poorer residents, as in the case of the London Boroughs of Tower Hamlets and Camden, whilst other councils have carried on demanding money through the courts and bailiff enforcement action. The London Borough of Hammersmith & Fulham has instigated an ethical enforcement approach and will end the use of bailiffs for council tax arrears collection from 1 April 2018. ‘Heavy handed debt collection in the public sector is counter-productive: court action, bailiffs and lawyers call cost money, and can create high levels of stress and anxiety in families that find themselves in debt’ said Cllr Max Schmid, Cabinet Member for Finance of the council. What can we do? Many ward members put forward motions to the Hackney Labour Party once the council began a consultation in November 2017, increase minimum council tax contribution from 15% to 20%. The overwhelming majority of the members of the Party voted against the rise. Local trade unions, Tenants and Residents Associations and advice charities also opposed the council’s proposal. Regardless of this resistance, the council decided to increase the contribution by 3.8% on the grounds that central government had cut at least 10% of the council funding each year since 2013 and in order to continue to provide essential services in the borough. Regardless of the political make up of local councils, there has been a trend to charge those least able to pay council tax. If they are to pay, many are either using credit cards or getting loans from pay day lenders with all the attendant financial risks. I hear this constantly in my debt advice work. 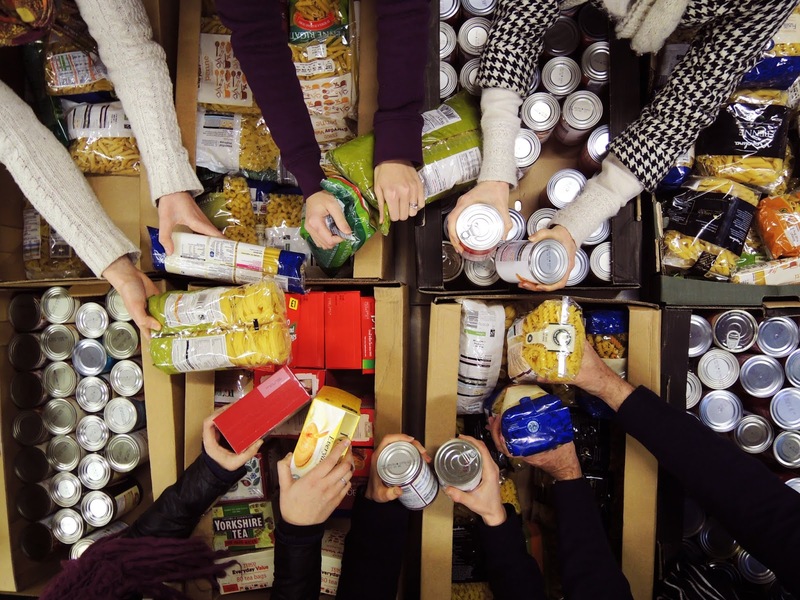 Further evidence of financial difficulty is indicated by the rise of people using food banks. The Trussell Trust Foodbank Network distributed just over 1,100,000 emergency three day food supply packages to people in crisis 2015-16. Between 1 April 2016 and 31 March 2017 distribution had risen to near 1,200,000 emergency packages. The situation for poorer people and communities is getting worse. Sadly, local council policy is very similar to what it was during the Poll Tax years and compounds the impact of Tory austerity policies. The real challenge is: can we organise our communities? If we can then in what form - who is strong enough to stand, and how can we manifest sustainable shift to a more just and effective system? Otherwise, I fear, millions of people like Joanna, are going to be left to suffer in silence. On 1 April 2017, Tower Hamlets Council introduced a policy that removed full Council Tax Reduction Scheme from its self-employed residents. The policy change to begin charge council tax to the self-employed was approved by the council’s Cabinet and the Mayor, John Biggs, on 10 January 2017. Those who are hardest hit by the measure are mostly mini-cab drivers who are managing their living from hire purchase agreements on their cars in order to facilitate their self-employment status. They are usually working from local mini cab offices and complying with tough terms and conditions, for example, Uber's rating conditions in which they are forced to keep above 4.5 star ratings from their customers in order to remain in trade with the company; otherwise they are barred from being on the list of its self-employed drivers. The council representatives accepted the policy change may expose many residents to poverty once a number of local advice agencies, such as Toynbee Hall, raised this concern to them.They reassured these agencies that the council has put an interim measure in place until they revisit a policy change at the end of this year. They also stated that if residents are experiencing financial difficulties they should consider applying for discretionary reduction under section 13(A)(1)(c) of the Local Government Finance Act 1992. Once the council has received such a notice, it's going to withdraw from taking any bailiff action against these residents if the main reason for non-payment of the tax is linked to affordability and self-employment. As the councils all over the UK are falling short of money to run essential services due to the reduction in public funds from central government and austerity measures, they are not shying away from charging residents who are least well-off. If anyone who is having difficulties paying council tax and self-employed, Community Money Matters urges you to seek advice from local advice services, such as Toynbee Hall, who are monitoring the impact the policy change is having to local residents and to give the notice required to stop any recovery and bailiff action. I am Ripon, a qualified Debt specialist for more than 6 years. This is my personal blog, all views are my own but the content is based on factual data available at the time of writing.